A new survey released by the U.S. Department of Justice shows the percentage of African Americans in the U.S. police department has remained stagnant since before the recession. The survey, which is a first of its kind since 2007, measures data gathered through 2013 on the demographic makeup of today’s national police force. While the report doesn’t provide a break down of minority numbers by individual police departments, officials say they will release more details about the data in the coming weeks. According to the results, the total number of police officers sworn into office at more than 12,000 local departments across the nation in 2013 was 477,000. 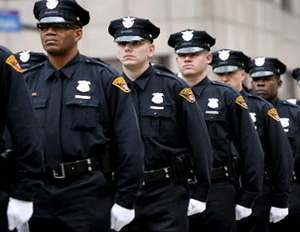 About 58,000 black officers were working in the U.S. in 2013, compared to about 55,000 in 2007. However, the percentage of black officers as a share of total numbers has remained flat at about 12 percent since 2007. With the recent killings of African Americans being brought to the forefront of news, several local police departments have come under fire for their lack of black officers on staff. In Ferguson, the city where unarmed teen Michael Brown was shot and killed, there are just three black officers on the police force that serves a community where 67 percent of its residents are black. Nelson Lim, a researcher at the Rand Corp., tells the Wall Street Journal that after consulting with the Los Angeles Police Department he understands first-hand how difficult it is to recruit black officers. The local police department was under a federal decree to diversify their work force and was legally allowed to use race as a factor, yet they were still unable to achieve their goal. Overall, the survey showed that the total number of minority officers rose nationally to 27.3 percent in 2013, compared to 25.3 percent in 2007, which was mostly due to the increase in Asian and Hispanic officers.